WASHINGTON — The U.S. Supreme Court has declined to hear an appeal of a ruling that overturned a lower court decision granting a preliminary injunction to a Maine minister who asserted that he was being unlawfully targeted by police outside of a Planned Parenthood facility for his pro-life preaching. The high court declined certiorari in the case of March v. Mills, et. al. without comment on Monday, allowing a First Circuit ruling against the preacher’s public proclamations to stand. However, as the courts ruled solely on the merits of the law and not how it was being applied specifically to Andrew March of Cell 53 Church, his attorneys will refile and continue the fight. As previously reported, March had filed suit in November 2015 after Maine Attorney General Janet Mills, a pro-abortion Democrat, filed a civil rights lawsuit to keep Brian Ingalls from standing within 50 feet of the Monument Square Planned Parenthood facility—or any Planned Parenthood location in Maine. Ingalls is an elder at March’s church. Mills alleged in her lawsuit that Ingalls spoke too loudly on Oct. 23, 2015 about “murdering babies, aborted babies’ blood and Jesus” while preaching outside of Planned Parenthood to the point that his pro-life pleas could be heard in the room where examinations take place. 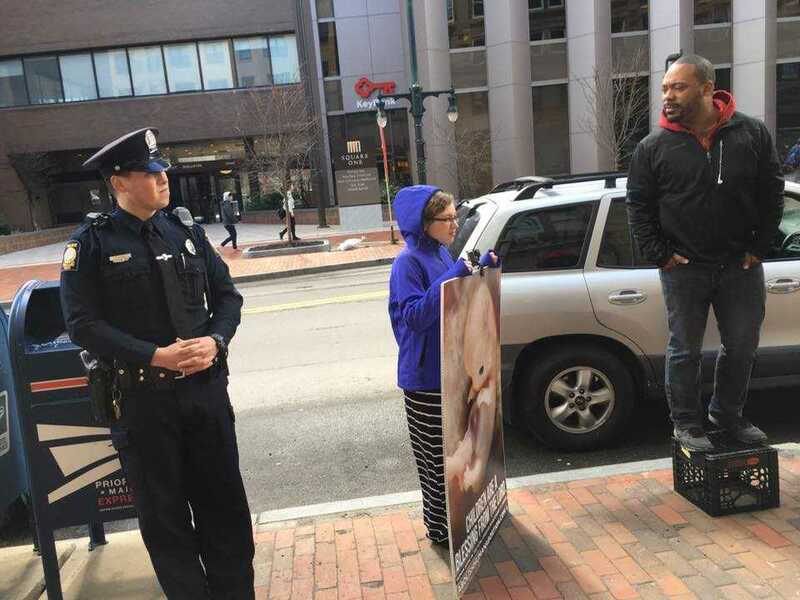 Police had confronted March and others last year to advise that their voices could be heard by staff and clients inside of the Planned Parenthood facility, and told them to keep it down. But officers reportedly did nothing when those in favor of Planned Parenthood could likewise be heard inside of the building. In seeking an injunction, March’s attorneys challenged the noise provision of the Maine Civil Rights Act, which states that after receiving a warning, it is illegal for a person to intentionally interfere with a medical procedure at an abortion facility. In May 2016, U.S. District Judge Nancy Torresen, appointed to the bench by Barack Obama, sided with March, opining that the “intent to interfere” portion of the law would pertain to the content of the speech, and would therefore only relate to pro-life speech, which would consequently be an unconstitutional content-based restriction. “Continued enforcement of a content-based restriction on speech would result in irreparable harm to the Plaintiff,” Torreson ruled. However, in August, the First Circuit Court of Appeals overturned Torreson’s ruling, stating that they rather found the law to be content-neutral and that it does not ban abortion opponents from conversing with others, as opposed to lifting up one’s voice to preach—if in doing so the person’s voice can be heard inside the building. “[T]he requirements laid out on the face of the noise provision do not indicate that the measure would apply to speech expressed at a normal, conversational tone—or even at a louder volume—absent the speaker’s intent to disrupt the provision or receipt of medical services,” it wrote. March appealed to the U.S. Supreme Court, and had several pro-life organizations back him in an amicus brief. Read the brief in full here. However, the U.S. Supreme Court declined to take up the appeal this week, and Planned Parenthood of Northern New England cheered the decision. “Once our patients walk through the doors of our health center they are entitled to care without harassment and intimidation shouted from the street below,” said Nicole Clegg, vice president of public policy.